Ok, the third line doesn't scan as right as it did when Ol' Blue Eyes sang the original, but I'm no Sinatra. Anyway, this is my FPL season review, and he's now long gone and unable to sue me for copyright infringements so who cares? 2009/10 and 2007/08 are obvious highlights, and it is a pity I cannot remember how high a ranking I had actually achieved during the season, but I do recall being very high and taking a risk that backfired in 2009/10, but that did still result in a very respectable final standing. This season, I decided to make a concerted effort to improve my fortunes, and try to endeavour to climb as high as I possibly could. I was helped with the amount of time I could devote to FPL by having an infant son who has not slept through the night in 2 years, and this allows me to access the internet and the FPL Manager App and Twitter in the middle of the night whilst he keeps me awake screaming. And so we arrive at GW1. DGW1 no less, with an opportunity of loading up on Chelsea and Aston Villa players in an attempt to steal a march on those less experienced managers who may not have factored this in to their pre-season planning. And so, a successful GW ensued, I definitely got lucky in that Azpilicueta was auto-subbed for Norwich City defender Steven "Forest" Whittaker, who scored and assisted in a 2-2 draw against Everton. This was the only thing he did all season. So yes, definitely lucky rather than an inspired pick. This left me in 158,872nd position; a useful platform to build from. I believe a good start is extremely important, if not essential to your FPL fortunes in the main. Although it can be argued it is harder to defend a lead as opposed to chasing your opponents down. For proof of the latter, we only need to look at the fortunes of this years "Arsenal" manager, Luke Weston (@theSilvaSurfers) who was ranked number 1 in the WORLD for an astonishing 17 GW's (including a "longest run" of 9 consecutive GW's), and who was still No.1 going into GW36. He eventually finished 8th after being hunted down and overtaken at the final hurdle. Interestingly though, Luke made a fantastic start to the season (835th after DGW1) and although he slipped to 4334th at the end of GW2, he never looked back from there. Sorry for bringing this up Luke - if you're reading - but hopefully you are not too disheartened by your final ranking as it needs putting into context with the stunning season as a whole. We'd all like to be in your position, let's put it that way! But, back to my own fortunes, I then suffered an early season collapse. Red arrows in 3 of the next 4 GW's saw me plummet to just outside the Top 1million. Not good. And to be honest, I was always playing catch-up from there. What happened here then? A poor points return in GW2 was compounded by a selection of RVP as captain (4 points) which had me a whole 10 points behind the GW average, with Eden Dzeko as my highest points scorer with a not very impressive 8. The following week I switched captain TO Dzeko, who did even worse than RVP and only scored 2 points after a 44 minute appearance. Hmm. 44 points was the average, and I scored bang on 44 points. This was when I SHOULD have noticed a certain Yaya Toure. He quietly picked up 11 points after scoring, keeping a clean sheet and picking up all 3 bonus points during Man City's 2-0 win over Hull City. I SHOULD have noticed this. But I didn't. Instead, I brought in the newly signed Arsenal midfielder Mesut Ozil. He did ok in GW 4, picking up an assist (and 6 points), but he was the wrong Arsenal midfielder to have in your FPL team, as history went on to prove. His assist points were picked up in making the goal for Aaron Ramsey. He also scored another that day. And got all 3 bonus points. The other assist for his goal game from Olivier Giroud. Who also scored. And who got 2 bonus points. The Gunners were hitting form after a shock opening day defeat to Aston Villa, and I had the wrong choice in my team. Bugger. At least captain RVP scored, but it left me only 7 points above the GW average which, although resulted in a green arrow, was not making the gains I wanted. So I brought Giroud IN. And captained him! Result: 4 points. BUT, Ozil made 3 assists so that was good news. But hang on, if they weren't for Giroud, who was he assisting? Sagna, Mertesacker and that man Ramsey. Despite the benching of Ramsey, GW6 saw me pick up a very respectable 73 points and saw me embark on a run of 8 weeks of consecutive green arrows shooting me through the rankings to just outside the Top 25k. 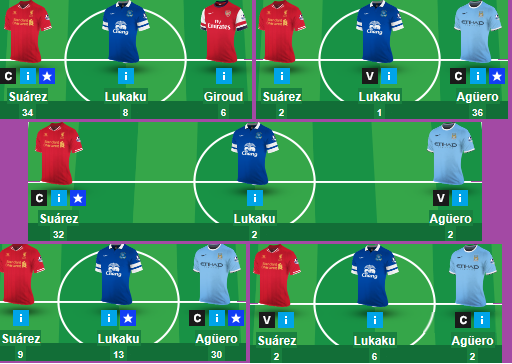 This was despite some abysmal captaincy choices; Giroud (4 points) in GW7 and Lukaku (4 points) in GW8. What happened from GW9 until GW19 became arguably the season defining moment for many many FPL managers. The formula during these weeks was simple: KISS. Keep It Simple Stupid. Captain Suarez when Liverpool were playing at home, and Aguero when Man City was at home. 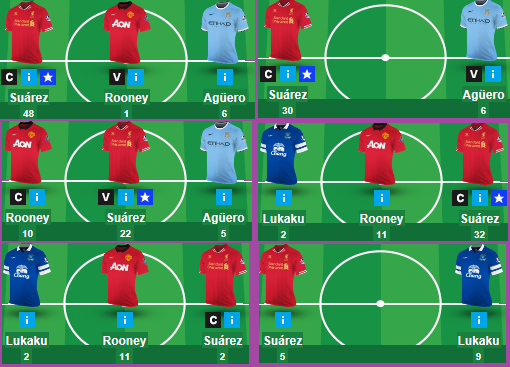 In GW9 Suarez bagged a hat-trick against West Brom. Meanwhile Aguero scored the consolation goal in City's defeat away to Chelsea. I decided to bring him in for GW10 and give him the armband as City were at home to Norwich. They crushed the Canaries 7-0 with Aguero scoring one and racking up a hat-trick of assists. Meanwhile Liverpool and Suarez were losing 2-0 away to Arsenal. GW11 saw Liverpool at home to Fulham and Man City away at Sunderland. The armband went back to Suarez who scored two and assisted another. Man City lost 1-0 to the Black Cats. In GW12 it swapped again; Liverpool away to Everton saw Suarez score and assist, but Aguero had the captaincy as Man City destroyed Spurs 6-0 at the Etihad with the Argentine scoring two and assisting another. The formula couldn't fail! The fixture computer had somehow managed to alternate Man City and Liverpool's home fixtures and we had two of arguably the world's best strikers in red hot form, particularly on home soil! GW13 proved unlucky for many. As the formula dictated, Aguero got the armband as Man City were at home to Swansea. They cruised to an easy 3-0 victory, but Aguero decided to have an off day and contributed appearance points and a yellow card. Not a massive disaster as Liverpool were busy losing 3-1 away at Hull with Suarez also having an off day. A green arrow was still gained as I was at this time fielding not one but TWO Arsenal midfielders (Ramsey and Ozil) who brought in a combined 26 points. Nice. I was missing something. I looked at my team. Suarez. Check. Aguero. Check. Ramsey. Check. Rooney. Check. Ozil. Check. Hmm...Well, I had transferred Oscar out prior to GW14 and drafted in Jordan Henderson. That had backfired. However, as we shall see, he proved to be a vital insurance policy in a couple of weeks time. Nope, I couldn't see what I was lacking. Crystal Palace were starting to rack up some clean sheets, but I was happy with my defence. I had got rid of my Chelsea cover but Oscar was dropped by Mourinho and never recaptured any consistent form for the remainder of the season. I know now what I was missing. Because hindsight is a wonderful thing. I had fallen victim to a phenomenon I later wrote an article on for this very Blog; Player Prejudice. I was overlooking two crucial FPL players that ultimately prevented me from reaching the very highest ranks this season. Step forward Mr Hazard and Mr Toure. That's Yaya by the way, not his extremely useless brother Kolo. 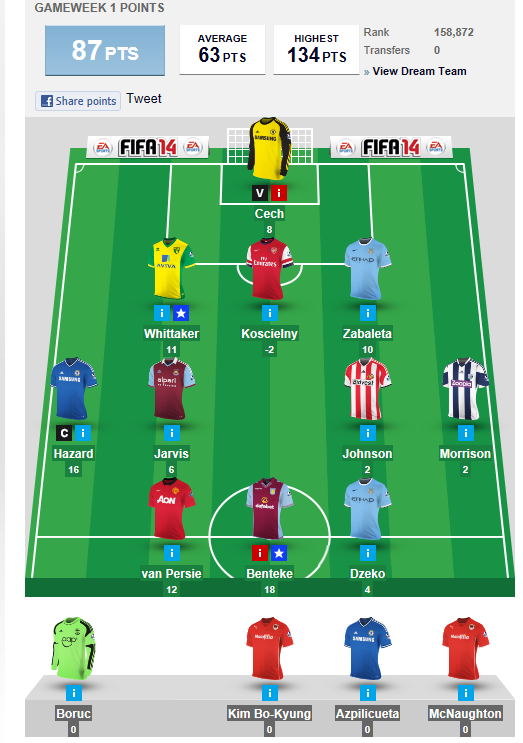 Yep, in GW14 Hazard contributed 17 points and that man Yaya a useful 15. And I had neither. Why? Well, as you have read I had both earlier in the season. My prejudice saw my adamant that Hazard's form would drift off as the winter nights took hold (don't forget GW14 was early December) and Yaya is primarily a defensive midfielder who was getting lucky with the odd free-kick. And we all know not to put defensive midfielders anywhere NEAR our FPL teams don't we? Gareth Barry anyone? So, a red arrow it was and I ignored the danger signs because I subsequently went on another run of consistent greens (except GW18). GW15 saw the formula work its magic again; A goal and 2 assists for that man Suarez as Liverpool beat West Ham 4-1 at Anfield, and a goal (plus a booking) for Aguero as Man City were held to a draw away at Southampton. GW16 was also memorable for being the end of any worthwhile contribution from Sergio Aguero. An injury in the Arsenal game saw him out until mid-Jan, when he returned with a goal and assist in a cameo appearance against Cardiff, but it was a false dawn. He went off in the following game (GW23) and didn't return until mid-April. In fact the next time he played 90 minutes was in GW38. A new striker was needed. I chose Lukaku. Hmm. I learned from my captaincy mistake though and Suarez got the armband in GW17 and 2 goals and an assist later, I was quite happy. Lukaku meanwhile picked up 2 appearance points. Hmm. Aguero's injury had ruined the formula. 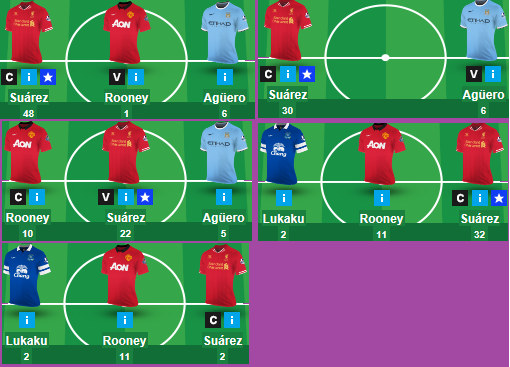 GW18 had Liverpool away at Man City, and despite all of the alarm bells ringing I stuck with Suarez as captain. Mistake. 2 appearance points. Plus 2 from Lukaku. Hmm. Rooney provided some form of damage limitation but GW18 was a personal disaster. 35 points. Big red arrows. Looking back now, guess who was in the GW18 Dream Team? Yep, Eden Hazard. I still didn't see it. GW19 was rescued by my defence. I lost confidence in Suarez (although he did provide an assist for Skrtel in Liverpool's 2-1 loss away at Chelsea. I had zero confidence in Lukaku (Hmm) but was sticking with him, so the armband went to Rooney. Who didn't play. By this time I had brought David Silva in for some Man City representation. Yes, that's David Silva. Not Yaya Toure. But the Spanish maestro was in a run of decent form so I had selected him purely as a differential as his ownership stats were still under 5% compared to every man and his dog (except me and Matej - @CalledItFPL) owning Yaya. But Silva only provided 4 points so it was up to my defence consisting of Liam Rosenior (clean sheet), Jonny Evans (clean sheet and 3 Bonus points) and Seamus Coleman (goal scoring and 2 Bonus points) to salvage some pride. Surprisingly, GW19 saw a green arrow and I broke into the Top 10k for the first time this season. And so, that concludes Part 1 of my own personal FPL review. Stay tuned for Part 2 as we explore GW20-38. And I will finally reveal what happened that day in North London when FPL worlds collided as @FPLHints (The Chief), @CalledItFPL (Matej) and @FantasyYirma met up in person for DGW31. Hope you enjoyed reading. Feel free to leave a comment or tweet me directly. 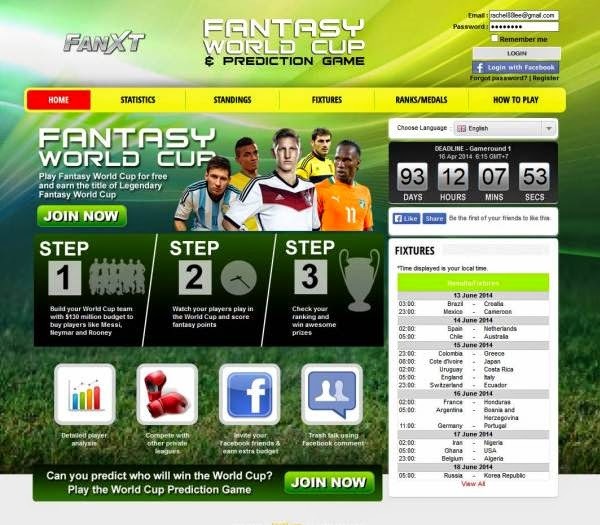 After the success of its Fantasy Pre-World Cup game, FanXT has launched its Fantasy World Cup (http://fantasyworldcup.fanxt.com) game to offer World Cup fans a once-in-4-years chance to build a virtual World Cup team based on real-life World Cup players such as Lionel Messi (Argentina), Neymar (Brazil), Cristiano Ronaldo (Portugal) and Wayne Rooney (England). These fantasy football managers earn points based on the performances of these players that play in FIFA World Cup 2014 matches. As the world would watch in awe the action and drama behind the FIFA World Cup, football fans could take on the challenge to earn the coveted title of Legendary Fantasy World Cup Manager, something many failed to do in the previous Fantasy World Cup 2010. 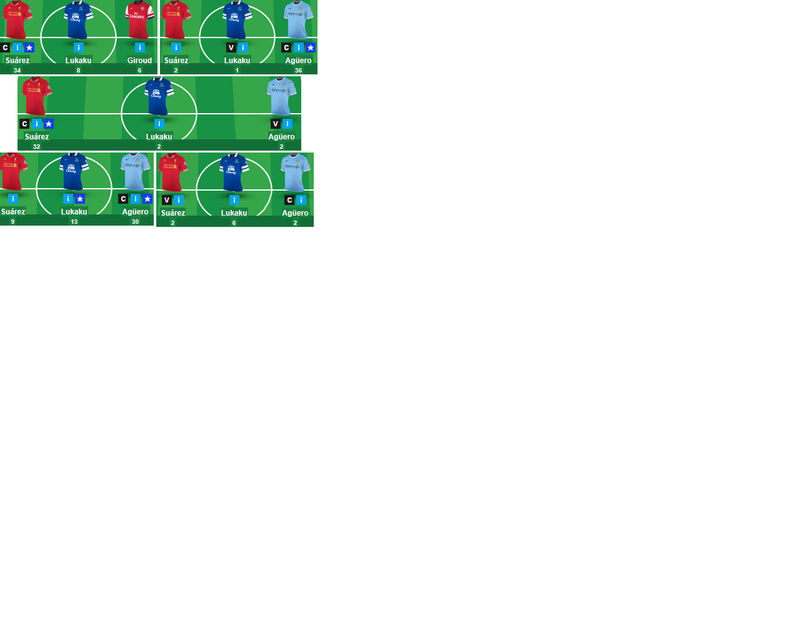 The game offers 12 statistics for users to score fantasy points such as Goals, Shots On Goals, Assists to score valuable points, ability to assign a captain, analyse players’ performance based on detailed graph analysis, choose their team formation (4-3-3, 4-4-2 or 5-3-2) as well as create private or mini leagues for users to compete among their friends. The socially savvy can also invite friends to join via Facebook and earn extra $0.5 million virtual budget for each friend who joined. Fantasy managers start with the rank of Rookie Manager but as they advance in the game, they could eventually earn the Legendary Manager title, something many failed to do in the previous Fantasy World Cup 2010. A WorldCup Predictor game is included in the website, which challenges users to predict the outcome (including the score) of all 64 matches and predict who will lift the World Cup trophy this year. For those early bird users that joined the pre-World Cup fantasy soccer game prior to this one, each of the fantasy manager shall have their fantasy points earned to be converted to extra virtual budget in this final World Cup game. It pays to be early. Fantasy sports are enjoyed by over 83 million people globally and according to Alexa statistics, fantasysites are 3 times more engaging than popular sites like Yahoo, CNN, ESPN and even the official FIFA World Cup site itself. This highly engaging fantasy football game for World Cup is available in Spanish (http://fantasyworldcup.fanxt.com/es), Chinese (http://fantasyworldcup.fanxt.com/cn), Indonesian (http://fantasyworldcup.fanxt.com/id) and Portuguese (http://fantasyworldcup.fanxt.com/pt) languages and playable on these platforms below. Last year I finished 12th. Name in lights - "Best FPL Blog" Finalist. 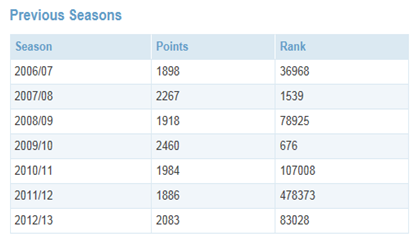 Finishing 5th in the competitive Pundits League. Winning the @FPLDugout Champions League. Football Blogging Awards (Nov 2013) - Good times! Only scoring 80+ during 2 DGWs. #MNF Captain fails via Ramsey & Ozil. Finishing outside the top 1%... by 0.1%! I never bought a Southampton defender. I never bought an Arsenal forward. I never bought a Chelsea forward. I never bought a Stoke player. Me - Champions League winner and 5th in the Pundits League. Matej - Pundits Shield (for topping the Pundits Cup pre-play offs) and 4th in the Pundits League. Walt - Pundits Cup finalist and 9th in the Pundits League. Fly - Pundits League winner. Technically we did the "Treble" if we include the Shield, but in an undisputed sense we did the "Double" courtesy of the Pundits League and Champions League successes. Walt's sensational comeback: 1 millionth to 75k in the space of 23 Gameweeks is no easy feat. You are fighting ghost ships, quasi-nihilist thoughts and friendly jibes for one thing. But he got back off the canvass, gritted his teeth and shot up the rankings like there was no tomorrow! He even managed to make the Pundits Cup Final. For that dedication, focus and success... we salute you Walt! "Oh, does anybody really give a rat's patootey about the bottom 8 at this stage of the game?" - Walt on his last #JITB of the season. "So I'm cured then! No longer prejudiced against any particular player or club (except West Brom!)" "The guys explain to me that it is illegal for 3 pm games to be televized in the UK. Say what? A joke? Apparently not". -Matej, as the mirage of English football falls flat to the ground! "Full-backs are the new centre-backs - watch them score more goals this season!" -Dolphin and his out-of-the-box thinking. "Take a look at that bantasy points tally and you'll need to take a cold shower and conjure a mental image of Susan Boyle in a two-piece before you can leave the house without walking like a pterodactyl to cover your shame". -Bantasy Jake and his active imagination. "It's not a bloody convention!" -Fantasy Yirma on my insistence that the DGW31 meetup was in fact a convention (it was!). "COME ONNNNNNNNNNNNNNNNNNNNNNNNN!" (Jumps from chair with fist aloft). -Me: DGW31 as Suarez knocks in his hat-trick in the presence of fellow FPL chums. 4 of the Top 10 are FPLH Pundits! Won by last year's Overall FPL Champion! I may have scored my highest GW score (173) and attained my highest ever FPL points score (2346), but I feel that I didn't fulfill my potential. I only scored 80+ on two occasions and my inability to do so during any non-DGW contributed to my eventual rank. Three things were problematic for me this season - not captaining the eventual highest points scorer in my team (semi-frequently), switching captains at the last minute (a handful of times) and making a few rash late panic transfers. I was targeting a Top 10k finish and got awfully close to it up to GW35... but bottled it with incorrect captaincy picks, failed transfers and injures as a I plunged down 20,000 places in the space of the last 4 weeks. Even before the season began I made few panic changes by selling Nolan, O'Brien and Southampton defensive coverage which lost me a few early points. I shudder when I recall that I had Downing, J. Morrison and Snodgrass in my squad... who were total fails. I started the season in medicore fashion and only moved from 227k to 117k in the first half of the season. Having said that, I was fortunate in buying Suarez, Ramsey, Y. Toure and Ozil relatively quickly, before they became bandwagon players but was reluctant to captain them early on which didn't help me. Also, I sold Toure as I thought his fine form couldn't continue! But I did re-buy him again. As the new year chimed and the ghost ship FPL accounts sailed away, my team gradually rose up the table. I took an eye-watering 72 points worth of hits. (the highest ever for my Blog Team) Sometimes they paid off, sometimes they didn't. Interestingly I only took one -4 hit between GWs 25-35. During this period I had risen up the rankings from 76k to 15k. Food for thought perhaps? My GW teams were atypical of past seasons' teams, 3-4-3/3-5-2 (cheap goalies and defenders) with robust midfielders and solid strikers. Having said that, I could have done with the likes of Skrtel and Baines in my team but they were over-priced (and will be more so next season). In terms of my wildcards, I didn't panic and I believe that I used them at the right time. The time of their usage kept me in good stead and if anything were damage limitation for me. 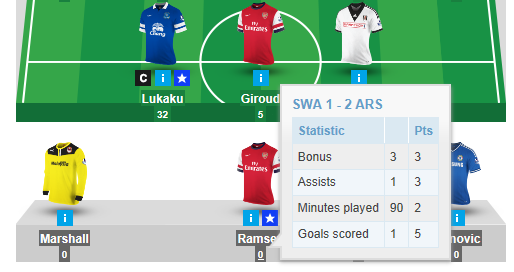 Had I panicked and used my all-season wild card early, I wouldn't have score 173pts in DGW31. As the season progressed, I shifted my Arsenal core team (Gibbs/Koscielny-Rambo-Ozil) as their wheels fell off and emphasised on Liverpool ("SAS" combo). I joined the Gerrard-bandwagon late on, but still managed to reap some rewards from it. This was complemented with my City core of Zabaleta-Silva-Toure (later becoming Zabaleta-Toure-Aguero). I shouldn't have been so patient with Lukaku and to my dismay Barkley seemed to fail when I had him and did well when I sold him/didn't have him! Despite having a sub-par season, I sensationally won the much coveted @FPLDugout Champions League. I got lucky along the way as I won some H2H ties by a few points and my opponents sometimes benched the "wrong" players. Winning it means a lot to me, as you get some great banter with the participants and I won their regular league to boot back in 2012. To date, I am the only person that has won those two prestigious @FPLDugout accolades and I did so in the space of three seasons. I would like to finish off by thanking all of my writers (and pick makers) that contributed so fantastically over the last 38 Gameweeks. They are a great bunch of lads who took time out of their lives to make your lives that bit easier. Just think about that for a moment. Also a special thanks to all of our partners and their superb support. Congratulations to LIVERPOOL FOOTBALL CLUB . You are FPLH's Team of the Season 2013/2014. 2 FREE TRANSFERS WERE AVAILABLE FOR GW38. Nostalgia & apt as it's also a World Cup year! (Note - Fast forward the first 30 seconds). Everton technically have nothing to play for. But Hull may be fielding a B-team in their final PL fixture of the season with the FA Cup Final in mind. It's Lukaku's last match for Everton and didn't he score a hat-trick at the stage last season? He sort of made up for that "slip" against Chelsea by nicking in with some assists in DGW37. Liverpool will be looking to romp home with a big win v NUFC and will be hoping that City get hammered by West Ham. Sherwood brought him in from the cold and helped him rediscover his scoring boots. Adebayor will be looking to sign off in style and help Spurs seal the remaining Europa League spot by scoring a goal or two. 3 of the 4 players I sold on the eve of DGW37 did well and scored good points! That, along with a -12 hit (I bought Vidic at the last minute), proved to be costly for my team. To top it all off my team was hit by injuries/rotations (Rambo, Rooney & Azpi were no shows), oh and yes I captained Mata, when I should have given the armband to Y. Toure. Enough of those knockdowns and let's look at GW38... It's usually notorious for big players being rested and random players being given game time. With this in mind, I decided to only buy players who still had something to play for and were playing at home against questionable opposition. I decided to re-buy Suarez (I shouldn't have sold him last week) as LFC are still mathematically still in the title race and he will be looking to break the PL scoring record. My second transfer was for his teammate - Sterling. Liverpool will be looking to win with by a cricket score for their fans and he will be integral to their brand of free-flowing football on Sunday. If Aguero wasn't blighted by hamstring injuries, I may have opted for him. After all he scored that famous Championship winning injury time winner v QPR in 2012. I have retained him, but instead have given the armband to Suarez. He will be looking to end Liverpool's PL campaign on a high and if anyone will score a hat-trick on Sunday it will be the Uruguayan. Despite having a horrific DGW37, I actually took a +7 lead in leg 1 of my Champions League final! While I had a rocky DGW37, The Fly took a huge lead in the Pundits League and is on course for an outright win! Sadly, Matej lost his Pundits Cup match and Walt got Rumbled out of the FPLH Battle Royal 2014. However, Walt got through to the Pundits Cup final! While we can't do the collective Quadruple, we are still on course for the Manchester United-esque League, Cup and Champions League Treble! As some of you may have heard via Twitter, I am due to semi-retire as a "Pundit" from August onwards. The blog will carry on and I may still post my team from time-to-time, but you will get less hints from me - it will be a re-jigged format. I will have a think as to what service we will provide after the World Cup. Matej - The Cool One. Walt - The Zany One. Fly - The Cheeky One. Dolphin - The Statto One. Bantasy - The Comic One. 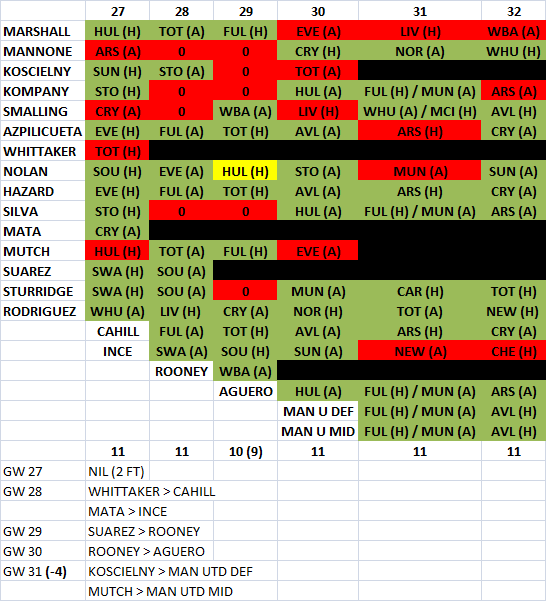 PS - I am due to post my usual all-season summary & stats after GW38 (but before the World Cup). Stay tuned for them!